Monica Hokeilen standing in front of her tent at the Art on the Avenue festival, 6 Oct 2018. 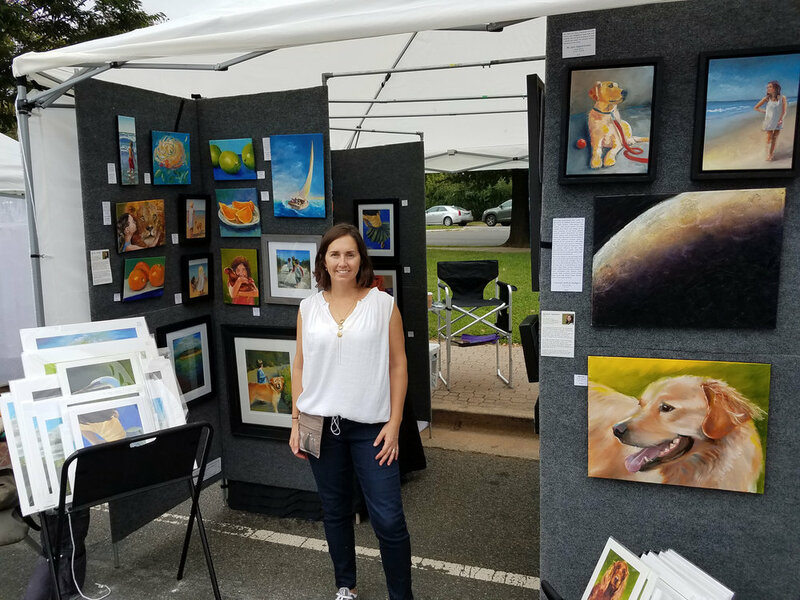 The Art on the Avenue Multicultural Art and Music Festival in the Del Ray neighborhood of Alexandria, Virginia was again a success this year. With over 300 artists, 5 music stages, near-perfect weather, and despite being a holiday weekend, festival-goers of all ages crowded Mt Vernon Ave, admiring the artwork and crafts as they flowed through. This year my tent was on the north end of Mount Vernon, with the front facing the busy street that was blocked off for pedestrian traffic only, a grassy lawn behind, and a music stage nearby. So I opened my tent in front and back, allowing people to move through it from both sides. Friends and strangers wandered in and out of my tent, talking with me and each other about what I created. It is always nice getting feedback, and was extra heartwarming when someone walked in and fell in love with a piece of my art. The front, street-side of my tent with prints and many of my favorite pieces. This is the direction most people first approached my tent. Inside my tent with “Local Sights” and “In the Garden” and other favorites. Inside my tent - a “Space and Science” room with a table for business cards, note cards, etc. Looking from the back grassy-side of my tent with “Children at Play” and the other end of the wall with “Local Sights” and “In the Garden” and other favorites. A look straight through from front to back. The room behind the long wall on the right had framed prints, “Life on the Farm”, and backup pieces to move out as pieces sold. My spot behind the tent with a view between the gallery walls. My family was a big help with setting everything up and then taking it all back down. While many moments during the festival were busy, some were quite. That was when I got to sit back and people-watch. Some festival-goers would hurry by on some errand or rendezvous or goal. Others meandered, expressions popping and changing on their faces as they took in the art in one tent and then another. Sometimes someone would elbow their companion and point to one of mine, or wander in and pause to take in my pieces one by one. It was interesting (and sometimes surprising, which is probably a testament to being kind of new at this) to see which pieces got the most attention - which ones resonated with kids or sparked conversations or got purchased - and which ones didn’t. The positive feedback and opportunity to talk about my work and sell some artwork makes outdoor art festivals a lot of fun! But getting ready for festivals are a ton of extra work. The artwork needs to be finished, photographed, archived, edges trimmed with black paint if not already painted, varnished, framed or hanging-hardware (screw eyes and wire) attached to the back. Labels to be displayed next to the artwork need to be written and printed, cut to size, and velcro attached to the back so it stuck to the wall. Reproductions and note cards need to be professionally printed, archived, signed, and bagged, labeled with the size and price. Business cards and About the Artist cards and How to Commission a Painting cards also need to be designed and ordered. If I’m really on top of things, I then spend some time planning the layout of gallery walls and pieces to help the morning of the festival go smoothly. Finally, everything gets loaded into two cars the evening before the festival and the alarm set for pre-dawn hours. At the festival, the equipment and supplies and artwork are all unloaded. The tent goes up first, then the gallery walls, which need the feet on the legs adjusted to the uneven street surface and cross-support bars attached on top to keep them steady (a result of lessons learned after my first Art on the Avenue festival a few years ago). The paintings are hung with their wall labels, prints are placed in folding racks, and cards are displayed on a table. And then I can take a breath. Double check everything is ready to go, my square card reader is working, my chair is accessible but out of the way, my water bottle filled. Thank my awesome husband and son for helping me. And welcome people to my tent, my art, the festival. All of the preparations and work getting set up for an art festival are exciting and satisfying in their own way. But as someone who is used to being on my own, painting in my studio for most of the day, the steady stream of faces and conversation are exhausting. By the time a festival is over and everything is taken down and carted back home, I am ready for my bed. I often spend the whole next day as lazily horizontal as possible, buoyed by the friendly faces and supportive comments and excited purchases of another successful art festival.